Accessorize a kitchen or create personalized hostess gifts. It's quick and easy with adhesive stencils. Use stencil tape to tape off a 5in x 6in rectangle on the cookie jar. Use a specialty sponge to paint 2 to 3 layers of blue chalkboard paint. Before paint dries, carefully release stencil tape. 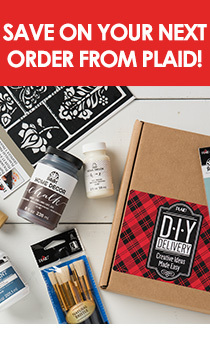 Use Tartan Red and a foam pouncer and follow general adhesive stenciling instructions.